Fig. 1. 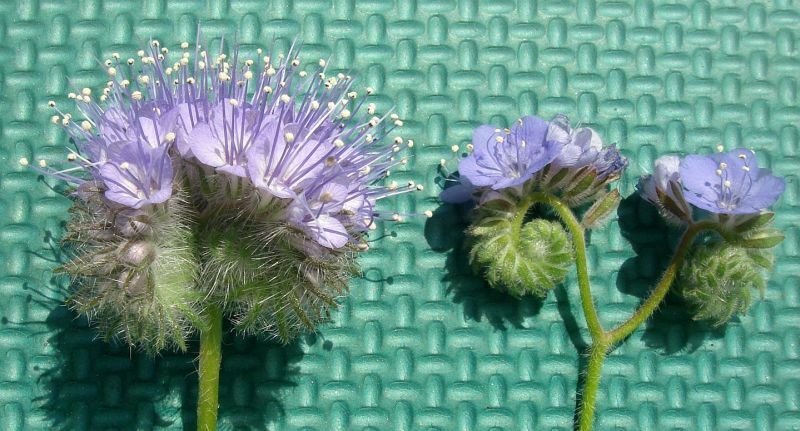 Left: Phacelia tanacetifolia, tansy-leafed phacelia. 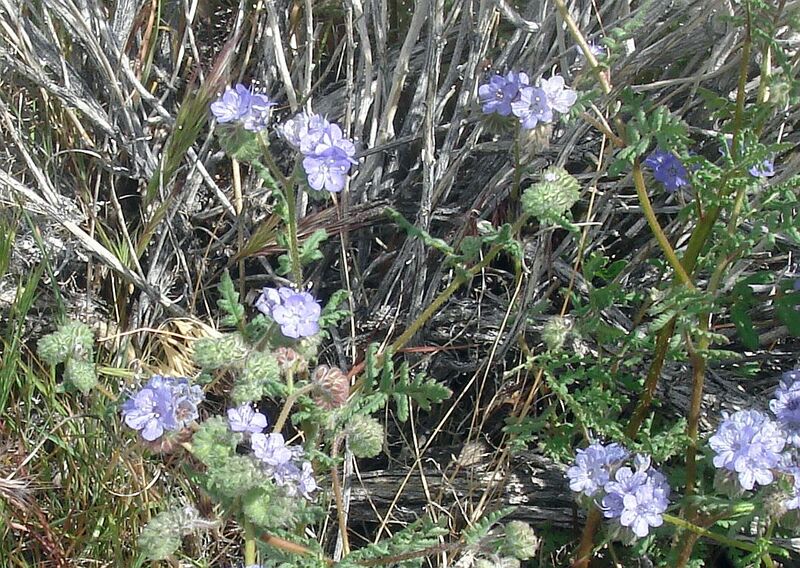 Right: P. distans, common phacelia. 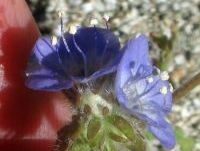 Note that although the stamens of P. distans are clearly exserted past the corolla lobes in some flowers (see especially its leftmost flower almost hidden from sight), the stamens of P. tanacetifolia are much more exserted. 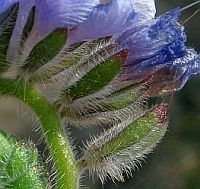 Also note the difference in the density of the flowers; the shape of the calyx lobes and the length of their hairs; and the color of the flowers. Picture taken by Tom Chester on 29 March 2014 of an inflorescence from each of two plants growing within ten feet of each other from the Mojave Desert near the junction of SR138 and SR18 just east of Palmdale.Click on the picture for a larger version. See also picture with a scale. 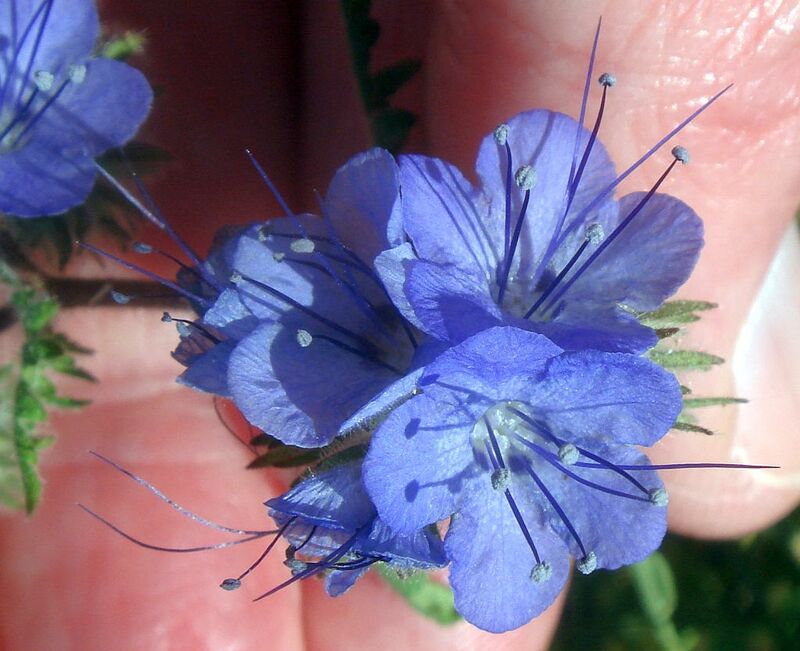 There is a lot of confusion about how to distinguish Phacelia distans, common phacelia, and P. tanacetifolia, tansy-leafed phacelia. This misidentification is likely mostly in one direction. Plants of P. tanacetifolia are probably only rarely misdetermined as P. distans. 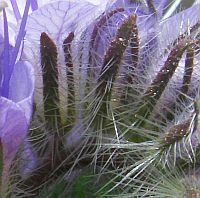 In contrast, many plants of P. distans with exserted stamens are routinely misdetermined as P. tanacetifolia, probably due in large part to bad keys and descriptions in some floras which lead to the conclusion that any specimen with significantly-exserted stamens "has to be P. tanacetifolia". My personal history in being confused about how to distinguish these two species, along with some tidbits I learned from looking at vouchers, is given in a Personal Historical Confusion About These Two Species. I was lucky enough to come across the two species growing within ten feet of each other from the Mojave Desert near the junction of SR138 and SR18 just east of Palmdale on 29 March 2014, where the difference between the two species was striking. I was also fortunate that Aaron Schusteff was with me at the time, who has seen many more plants of P. tanacetifolia than I have, and gave me some tips on its distinguishing characteristics. This page summarizes what I know about how to distinguish these two species. The following are characteristics that in my experience seem to provide a good measure of separation between these two species. 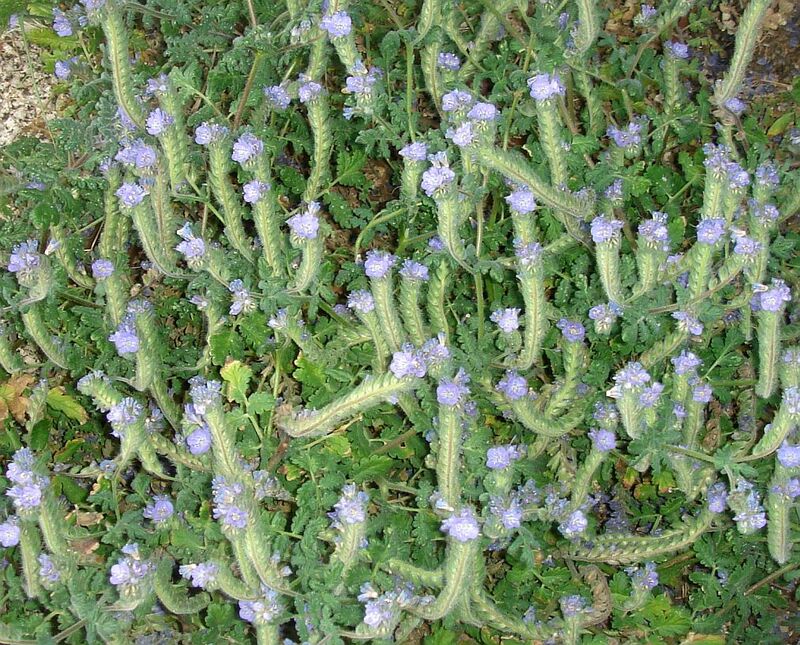 Since I do not have a lot of experience studying P. tanacetifolia at all, and my experience with P. distans mostly comes from the Borrego Desert and a few other locations in southern California, revisions to the following might be needed if plants elsewhere have different characteristics. Note that few of these characteristics are iron-clad, definitive separators of the species. Many of them are qualitative and comparative. But there are enough characteristics that taken together should allow the definitive determination of any given plant. 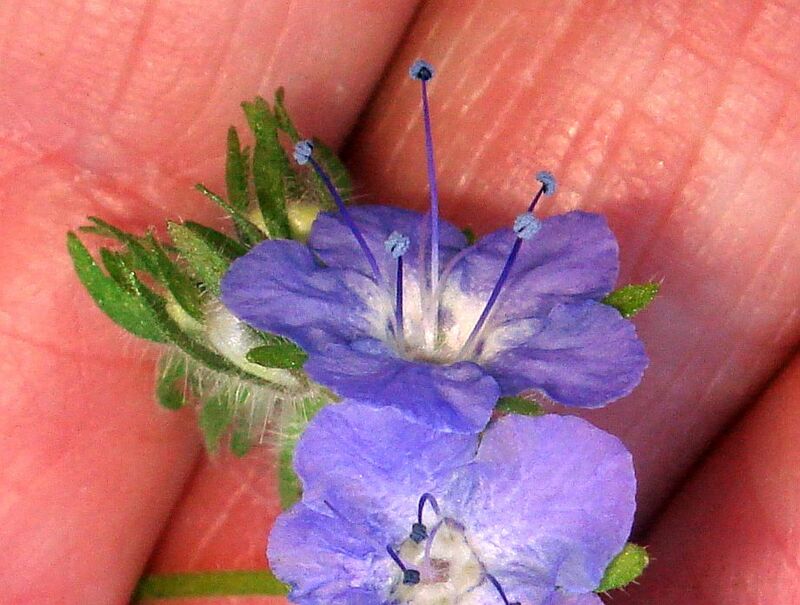 Length of the Stamens. 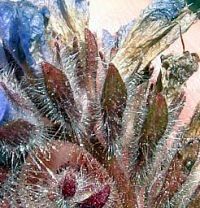 The stamens of P. tanacetifolia are much-more exserted than the stamens of P. distans; see Fig. 1. 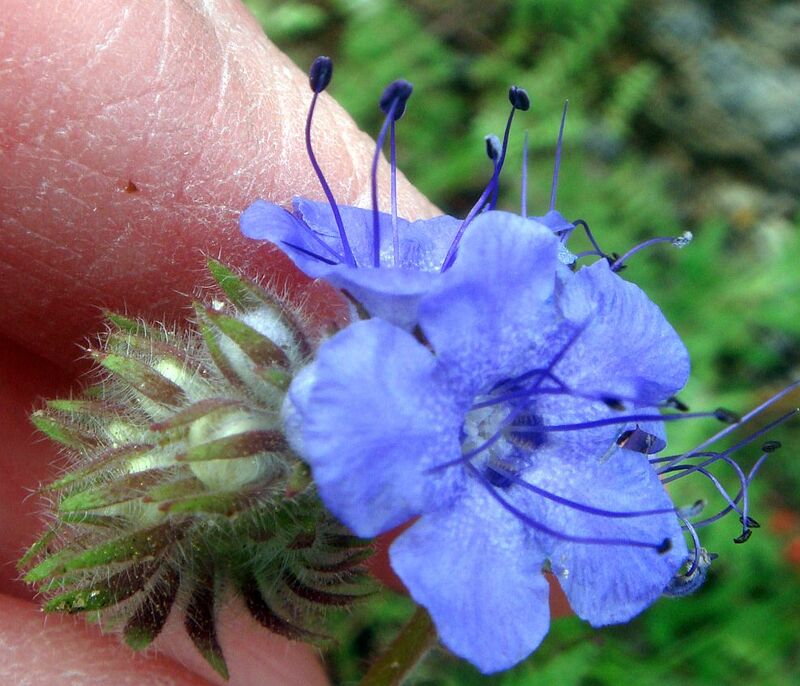 Although the stamens of P. distans are often clearly exserted, they are not as exserted as those of P. tanacetifolia. This is one of those cases where pictures are worth much more than any words explaining the difference. 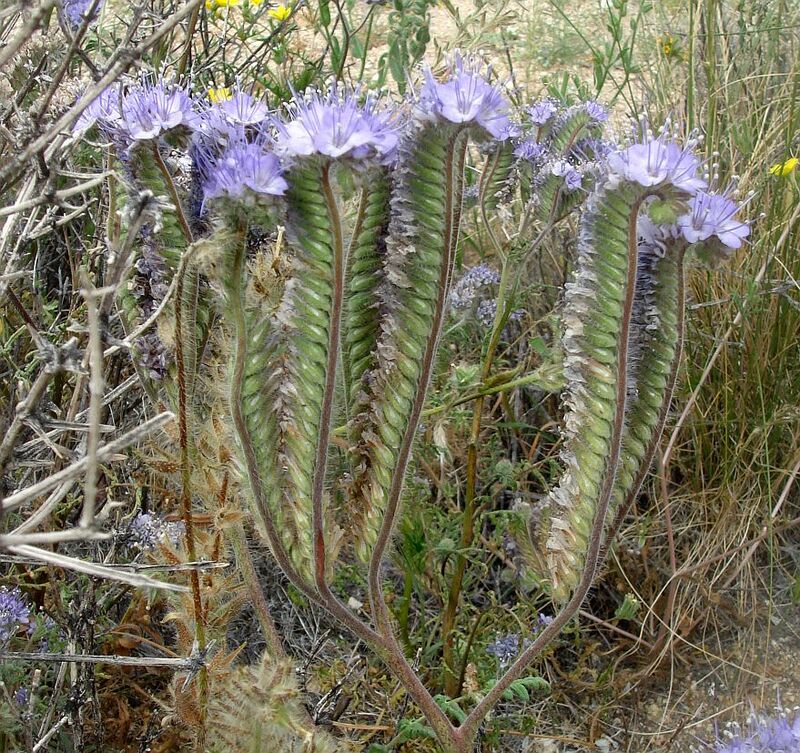 The Jepson Manual description is misleading in saying that the stamens of P. distans reach to the tips of the corolla lobes or less ("generally included or ± = corolla"); there are many specimens of P. distans in the Borrego Desert with stamens clearly exserted beyond the tips of the corolla lobes. Munz described it more accurately: stamens mostly not long-exserted for P. distans, and stamens long-exserted for P. tanacetifolia. 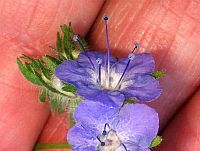 Note that Munz allows for some plants of P. distans to have what would be considered long-exserted stamens, as I have observed. 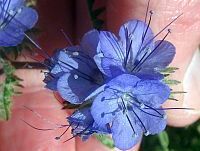 Note also that since the stamens are not attached at the base of the corolla, that the stamens can be significantly exserted even if the lengths given in the floras for the stamens are the same as the lengths of the corolla. Fig. 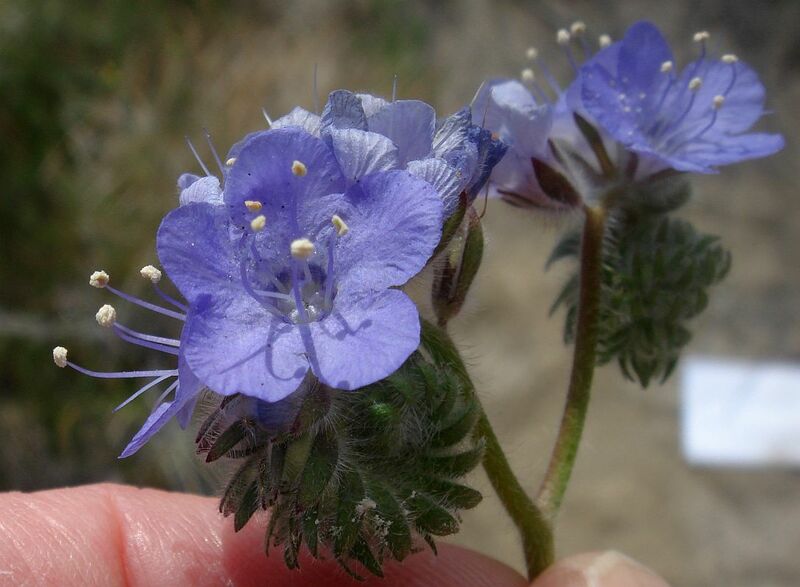 2 shows some examples of how exserted the stamens are for flowers of P. distans from the Borrego Desert. 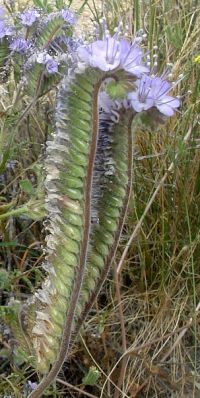 Although some of these stamens are clearly long-exserted, the flowers overall don't look anything like the flowers of P. tanacetifolia shown in Fig. 1. Fig. 2. 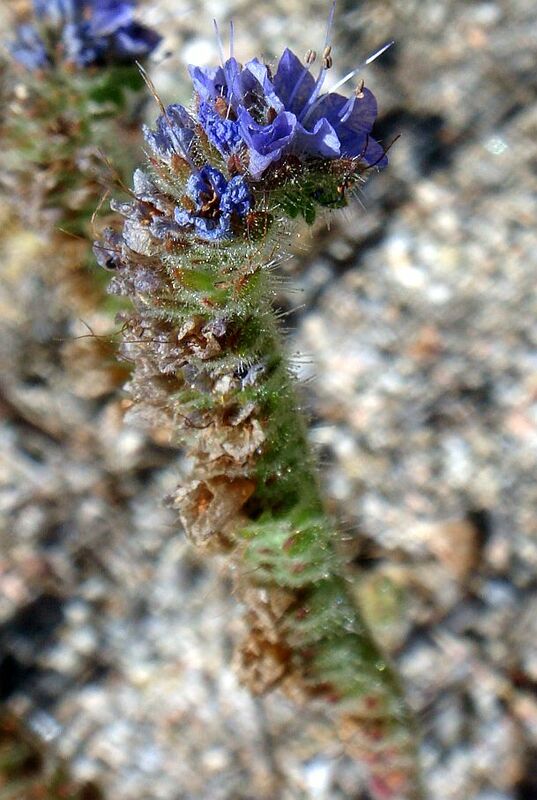 Pictures of P. distans from the Borrego Desert. Click on the pictures for larger versions. Persistance of the dried corolla in fruit. This is the key used in the second edition Jepson Manual (JM2) to separate these two species, but this separation is at best only generally useful and cannot be trusted 100%. 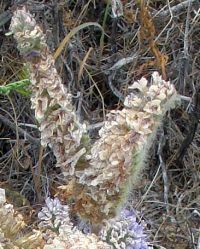 P. tanacetifolia holds onto its dried corollas much more consistently and frequently than does P. distans, but some plants of P. distans hold onto their dried corollas as well. The leftmost three columns of Fig. 3 show every plant of P. distans that I've ever captured in fruit in photographs, so there is no bias at all in selecting photographs here. The photographs in columns 2 and 3 show the upper and lower parts of the same inflorescence in the top and bottom row respectively. The rightmost column in Fig. 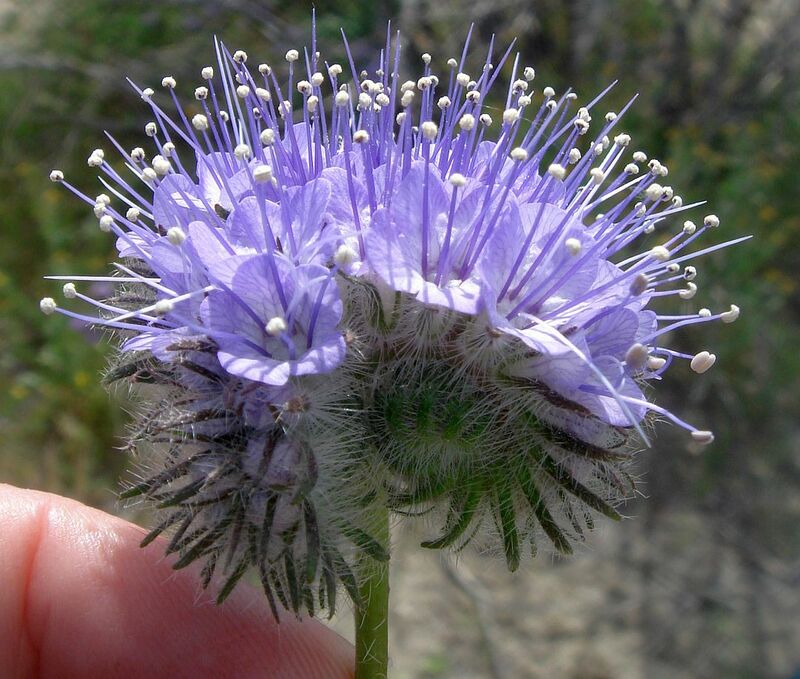 3 shows plants of P. tanacetifolia in fruit from the Mojave Desert just east of Palmdale. Fig. 3. 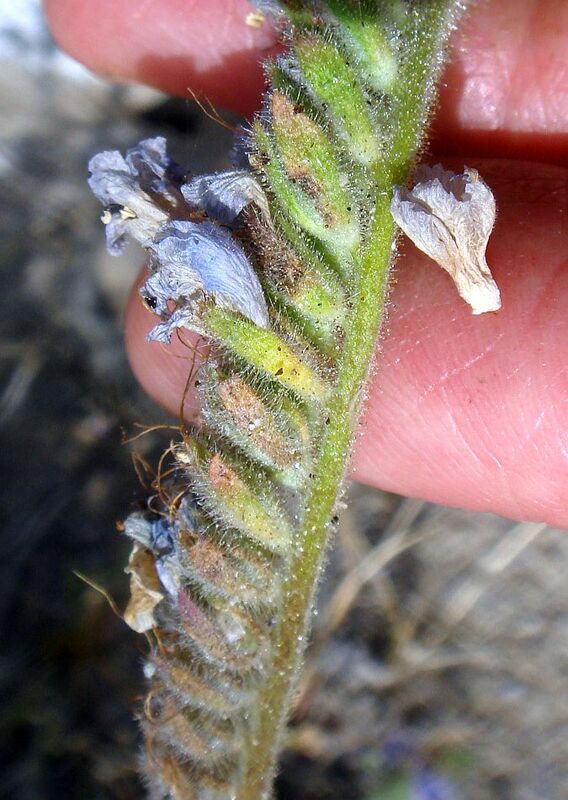 Pictures of P. distans (leftmost three columns) and P. tanacetifolia (rightmost column) in fruit. Click on the pictures for larger versions. 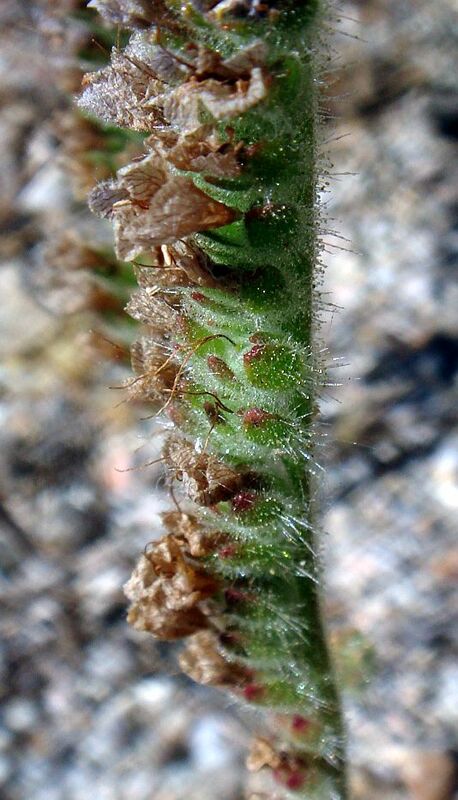 At the extremes, P. distans appears to be the only one whose corolla can be completely deciduous, and P. tanacetifolia appears to be the only one that can appear to have 100% of its corollas persistent. But there is a lot of ground in the middle that appear to be the same for both species in retaining their corollas. Number of inflorescence branches. Aaron Schusteff pointed out to me that P. tanacetifolia often has 3-4 inflorescence branches at the tip of each inflorescence, whereas P. distans typically has just 1-2 branches. This was clearly observed in the DMoj plants on 3/29/14 (pix linked in the next two paragraphs). The P. tanacetifolia inflorescence in Fig. 1 has four dense branches, forming a head-like cluster in its early stage before the cymes elongate, whereas the P. distans inflorescence has just two branches. Four branches are more evident when the inflorescence has mostly gone to fruit; the linked pix shows an additional two ultimate branches from a nearby main inflorescence branch. Some finished inflorescences appear to have five or more ultimate branches, but the linked pix may also be showing branches from another main inflorescence branch. 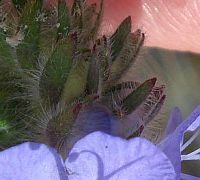 In contrast, P. distans appears to generally have just two well-separated inflorescence branches (closeup photograph). The JM2 says that the inflorescence of P. tanacetifolia is dense, generally 2-4 branched, but makes no comment about the inflorescence of P. distans. Munz says cymes few, simple to somewhat branched for P. distans, and says fls. many, short-pedicelled in prominent compact cymes for P. tanacetifolia. 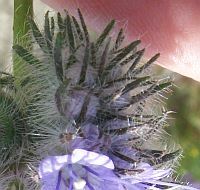 Sepal shape and hairiness. 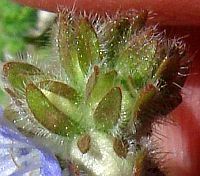 The calyx lobes for P. tanacetifolia are generally linear, whereas the lobes for P. distans range from linear to ovate to oblong to oblanceolate in the JM2 description. 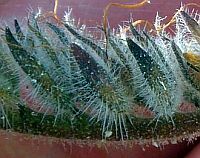 The hairs on the calyx lobes appear to be significantly longer for P. tanacetifolia, although this is probably a difficult characteristic to use in distinguishing the species unless one has them side by side. Fig. 4 shows the lobes of both species. Fig. 4. Pictures of the calyx lobes for P. distans (leftmost two columns) and P. tanacetifolia (rightmost column). Click on the pictures for larger versions. Flower Color. 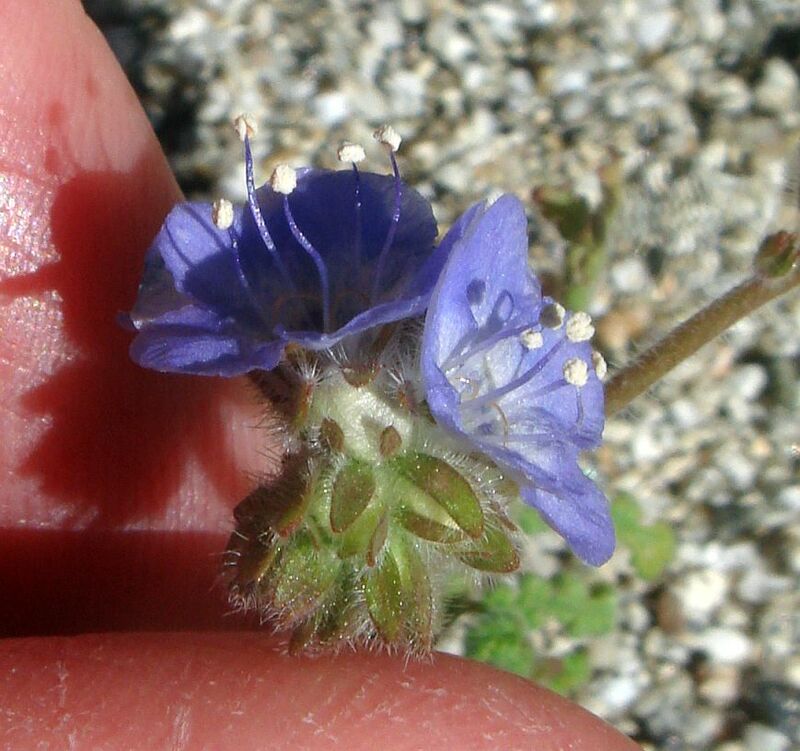 What struck all of us in observing the two species side by side in the Mojave Desert east of Palmdale on 29 March 2014 was that the corolla of P. tanacetifolia was not blue! It was more on the lavender side, enough that one person in our party thought it might have been P. cicutaria (which is usually a lighter color, and has much more hispid calyx lobes that are held away from the fruit; see for example this picture). Yet Munz keyed both of these species under corolla blue or bluish, and the JM2 gives the corolla of P. tanacetifolia as blue. 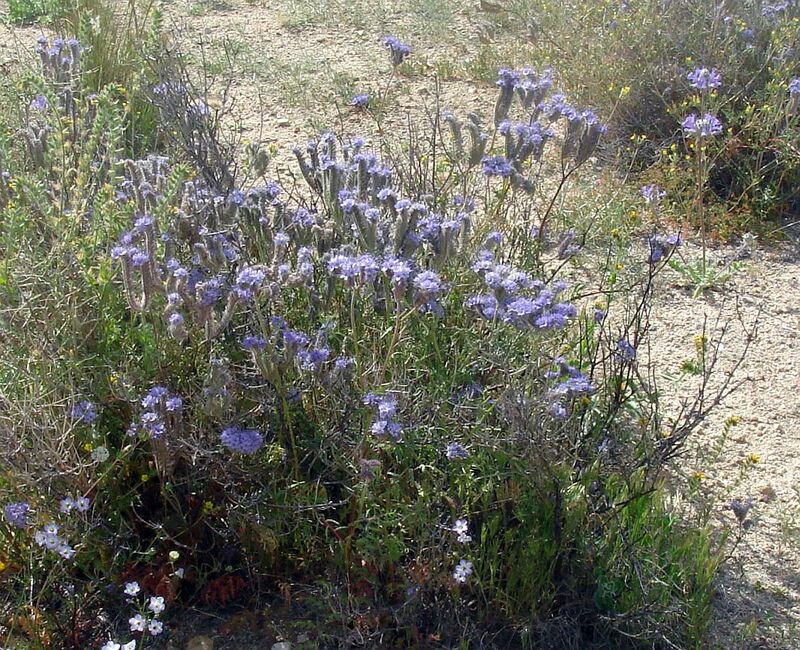 My experience in the Borrego desert is that P. distans ranges from a blue-lavender to a dark blue-purple, with very-uncommon white variants, as are observed in most plant species. However, the photographs at Calphotos show a wide variation in color for each species, enough that a separation by color might only be useful locally. Robustness of the plant. 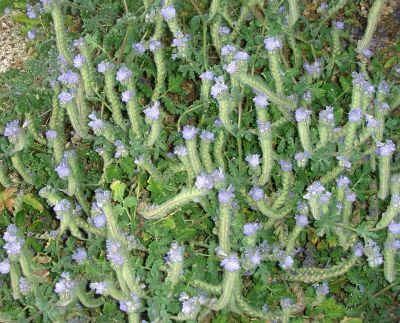 P. tanacetifolia seems to be a much stouter plant, with strong stems that can sometimes grow out in the open and be stiffly upright. 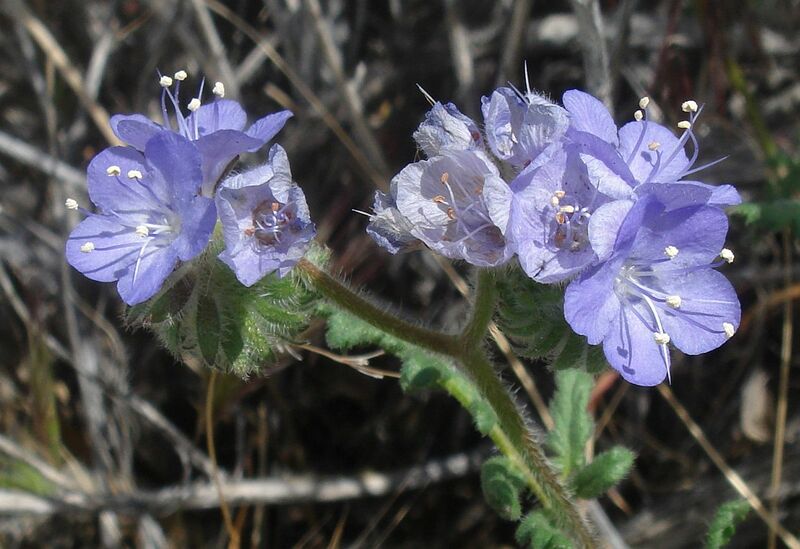 P. distans is a weaker, more sprawling plant that often is found only in the shade of shrubs. Fig. 5 shows this difference for two plants. Fig. 5. 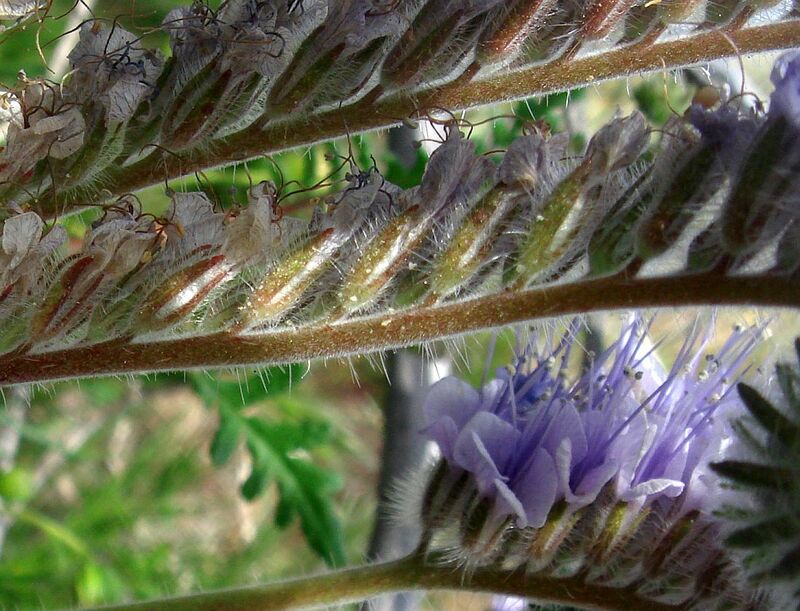 Pictures of the plant habit for P. distans (left) and P. tanacetifolia (right). Click on the pictures for larger versions. Pedicel length, used in the first edition Jepson Manual key, which may have contributed to some determination errors. Munz says that both species are short-pedicelled. The JM2 doesn't even mention a difference in the pedicel length. It is very difficult to see much difference in the pedicel length between the two species. Length of calyx lobes, used in the Munz key, 4-5 mm for P. distans and 6-8 mm for P. tanacetifolia. This undoubtedly contributed to some determination errors. The Jepson Manual negates that difference, giving the calyx lobes as 3-6 mm in fl, 4-8 mm in fr for P. distans; and 4-7 mm, 6-8 mm in fr for P. tanacetifolia. It is also worth noting that the JM resurrected the taxon P. umbrosa, which is a segregate from P. distans of plants more similar to P. tanacetifolia (at least in terms of being in the same couplet in the JM key). 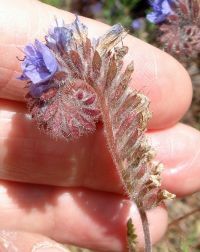 The JM2 comments that its relationship to Phacelia distans needs study. From the small numbers of vouchers in California, just six, all in San Diego County, it seems quite possible that this is just a false segregate from P. distans. In comparison, there are 432 vouchers of P. distans from San Diego County. It wouldn't be surprising to find that six of this large number of vouchers might look a little different from the rest and be falsely separated out. P. umbrosa is actually much nearer P. distans than P. hispida, as shown by the calyx and capsule. It may even be a mere variety of P. distans, as suggested by specimens from San Diego County -- Meyer 502, Palomar Mt., has flowers very similar to those of P. umbrosa, but the leaves are more nearly those of P. distans. I was very confused about how to distinguish these two species when I first began studying P. distans in the Borrego Desert. 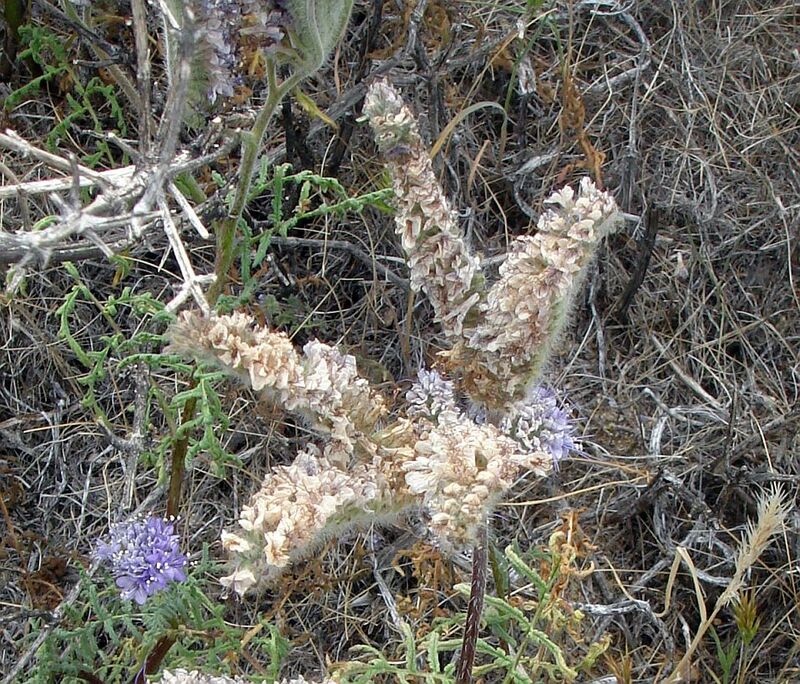 I studied the P. distans plants in the Borrego Desert for years, and they never seemed to perfectly fit either species as described in the floras. 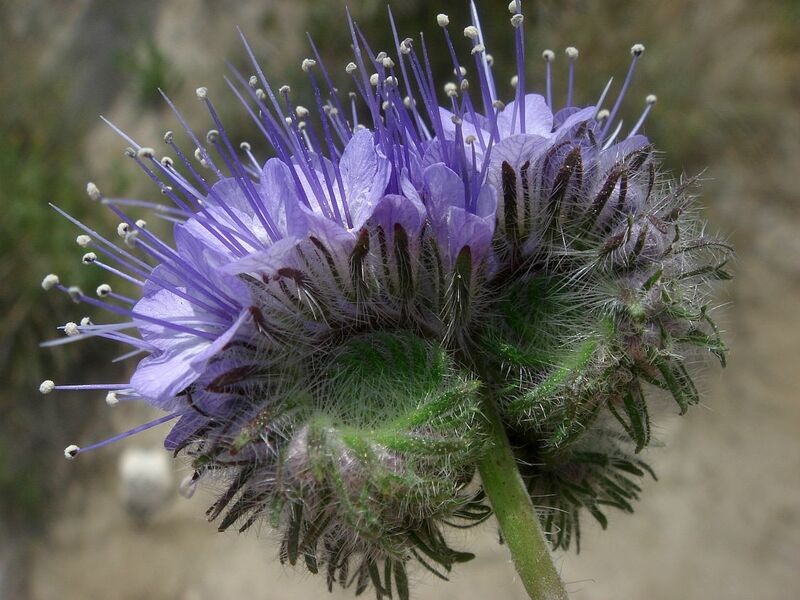 I was pretty convinced that all the plants in the Borrego Desert were the same, all P. distans, but I was troubled that they didn't closely fit the descriptions in the floras for all the key characteristics. In particular, the pedicel length in fruit didn't seem to fit the JM key. I visited the Rancho Santa Ana Herbarium in 2006 for other purposes, and at the end of the day had just 10 to 15 minutes to look at three vouchers that were determined as "P. tanacetifolia" from San Diego County to see if they really could be that determination. Before I did that, I looked at one folder for each species, each with roughly 20 specimens, to see if I could quickly come up to speed on the difference between the two species. The first thing I noticed was that a large number of specimens in each folder had originally been determined as the other species, a clear sign of a difficult species separation. I then used the easiest characteristic to check, whether the corolla was deciduous (i.e., persistent in fruit or not), I found that perhaps 5/6 of the specimens in the P. distans folder were deciduous, as advertised in the floras, but 1/6 had a persistent corolla. Similarly, 5/6 of the specimens in the P. tanacetifolia folder had persistent corollas, as advertised in the floras, but 1/6 had deciduous corollas. I concluded that either this characteristic was variable, or 1/6 of the voucher specimens in each folder were still misdetermined. I then found that the two other characteristics used in the first edition Jepson Manual key, the hairiness of the fruit and the length of the pedicel in fruit, were extremely difficult to determine in vouchers. Exposing the fruit requires carefully dissecting the dried calyx from the fruit, which is not an easy task on brittle, dried, old specimens. Also, curators are often not crazy about someone coming in and messing with a voucher. 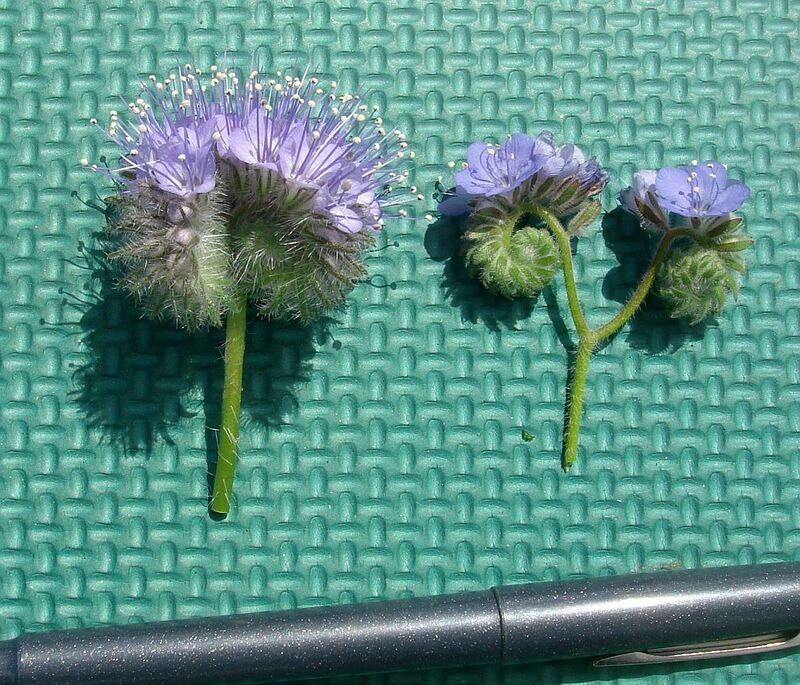 Measuring a pedicel length on a voucher is very difficult due to extremely crowded inflorescences that have been flattened. The pedicels I could observe seemed to possibly have some difference in length between the species, but the difference was mostly extremely minute and not necessarily significant. I then studied the three vouchers from San Diego County, and found that of two characteristics in the first edition Jepson Manual key, one characteristic went to P. distans and one characteristic went to P. tanacetifolia, an unhappy situation for getting a solid determination. By coincidence, I ran into Michael Charters later that evening at a CNPS meeting at the Eaton Canyon Nature Center, and asked him what the determination was of the phacelias blooming in front of our cars. I had already checked them for the two key characteristics, again finding that one characteristic went to P. distans and one characteristic went to P. tanacetifolia. These plants have been commonly reported as P. tanacetifolia by amateur botanists and docents for wildflower reports, but Jane Strong and I some years ago determined that these were actually P. distans. This spawned a nice investigation by Michael, which illustrates the difficulties in the key characteristics discussed above. He concluded that the species were best separated by the degree to which the stamens are exserted, and the shape of the corolla lobes, which is also seen in Fig. 1 on this page. When species are separated by subtle or difficult characteristics, it is often the case that people, including myself, sometimes will make two species out of one by considering plants at the edge of the characteristics in a given area as the two different species. Such artificial distinction usually immediately goes away when one sees the other species for the first time. Hence Wayne Armstrong and I finally made a special trip to the South Coast Ranges in May 2010 to try to find some bona fide P. tanacetifolia. After much field study, we eventually concluded we did see a difference between the two species, but the differences were somewhat subtle and hard to quantify, since we never saw the two species together. I had to rely on my poor memory of what P. distans looked like while I was seeing P. tanacetifolia, not a good situation. Even just several months later, my grasp of the difference between the two species was not good enough for me to reliably determine specimens seen in isolation. 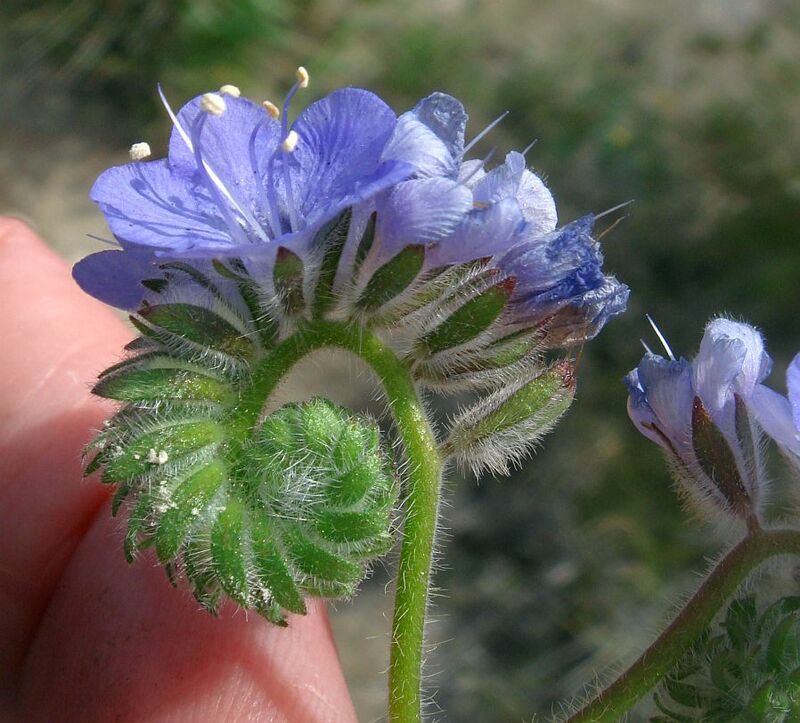 Seeing specimens of both species growing within ten feet of each other in the Mojave Desert near the junction of SR138 and SR18 just east of Palmdale on 29 March 2014 finally drove home the differences between the species. We had seen a lot of P. distans in the first spot we botanized. 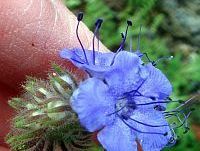 Some members of our party did the usual speculation that some of them might be P. tanacetifolia. Out of the corner of my eye, I suddenly spotted one specimen of P. tanacetifolia that was immediately, strikingly different as described above, and knew exactly what it was. I couldn't believe my good fortune! We were lucky to come across an area where the plants were essentially all P. tanacetifolia to the west of our first stop, with P. distans confined to our first stop on this trip. The differences were so apparent in gross habit that I recognized the next P. tanacetifolia plants, at our next stop, from 30 feet away!